Steve heads back to Mom’s where he insists that he’s going with her to recover the microfiche. Because ‘three retirees, launching a covert op? How do you think that’s going to go down?’ I’m thinking that Steve is just a little bit ageist. He also tells Mom that he’s lost her once – he’s not going to lose her again. That faaaaace! Mom realizes that he’s not going to take no for an answer. Tyler Cain exits the First Honolulu Tower for the evening, and the plan is put into action. Mick is in charge of the elevators and Wade is flying the chopper. I have to wonder, with all the security in this building, there’s no camera up on the roof? Steve and Mom exit the helicopter and enter the building. I really like this whole scene – reminiscent of Mission Impossible, and the music is great. Kono receives a visit from Chin, Danny and Cath. Kamekona brings some shrimp for Kono, because it has healing superpowers. After they leave, Adam turns up. 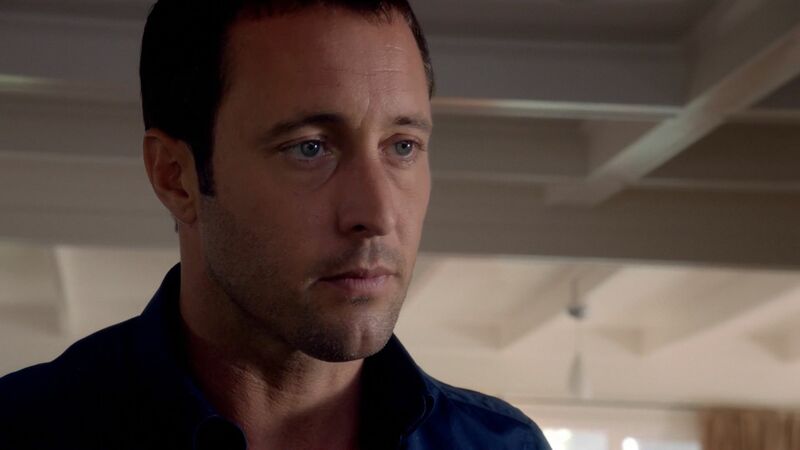 He admits that he thinks Michael is involved in the killing field, and feels responsible for Kono getting shot. I think Kono is about to tell Adam that she had his phone cloned, but a nurse arrives and Kono has to go for a CT scan. While she’s away, a phone rings. When Adam realizes it’s not his phone, he finds the clone. Uh-oh. Back at the First Honolulu Tower, the Amazing McGarretts are presenting tonight’s show. They drop down the elevator shaft to the sixteenth floor, where Mick tells them to hold up as the guards are watching the monitors. Mom decides to pass the time with a little magic card trick. I’m waiting for her to pull a fried baloney sandwich out of her backpack next. This scene is all kinds of awesome. Silly, but awesome. Suddenly, there is an ascending elevator and Mick has to set off the fire alarms. Steve and Mom manage to get into the hallway and make their way to Cain’s office, where they open the safe and steal back the microfiche. An alarm goes off. Wade notifies them that there are now guards on the roof, so escape by helicopter is out of the question. Mick tries to guide Mom and Steve out of the tower, but they’re chased by guards. 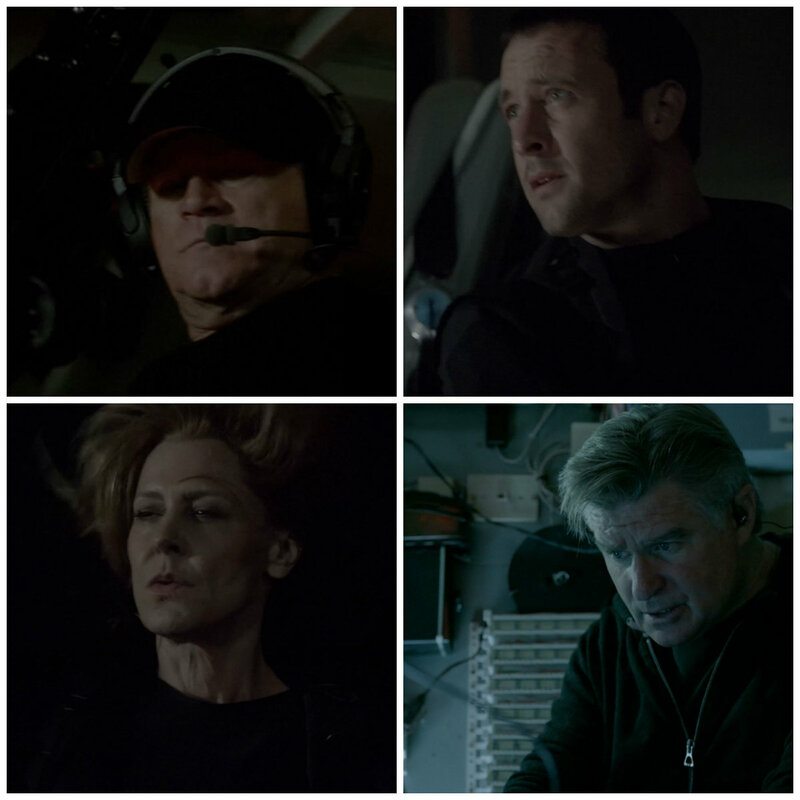 Steve tells Mom to go, and NinjaBAMF McGarrett takes out the guards. Steve catches a freight elevator down, while Mom puts on her own BAMF show but finally gets cornered, and Mick leaves the building. Okay….when did Mick become a hacker??? was Toast not available? I did love the old folks jokes about what you should be doing while retired……. Poor Steve, his entire childhood was a lie, he was raised by robot doris. I didn’t know I wanted a Toast/Doris scene until now. OMG, can you imagine??? That would be all kinds of awesome! So is the graveyard just Michael’s secret dumping ground that no-one else knew about? I didn’t quite get that bit. If Hiro knew about it then surely Adam would have known? Forgot to say, I was a bit ‘???? ?’ when I saw the magic trick scene in the sneak peek, but it made much more sense in context. It was a really sweet scene. I loved Doris’s smile :-). Kono is one tough chick. Shot in the stomach and able to eat shrimp so soon afterwards! Lots of fantastic McG faces in the ninja scene. McG and Doris are so good together. Pity she’s a LLWL who faked her death and abandoned her family. If he had just led with the part about not wanting to lose her again, it would’ve worked and he wouldn’t have sounded like such a jerk. Apparently McG has *not* seen Red. Agreed. If he’d seen RED, he would have totally been on board with it. I guess RED isn’t in the same league as The Notebook *eye roll*. Loved the capers and hijinks!